Discover the enigmatic work of this pioneering yet underrecognized painter, who bridged figurative, Surrealist, and abstract currents in modern art. Charles Howard: Prescience, 1942; oil on canvas; 28 1/4 x 40 1/2 in. ; The Metropolitan Museum of Art, New York, Arthur Hoppock Hearn Fund, 1942. 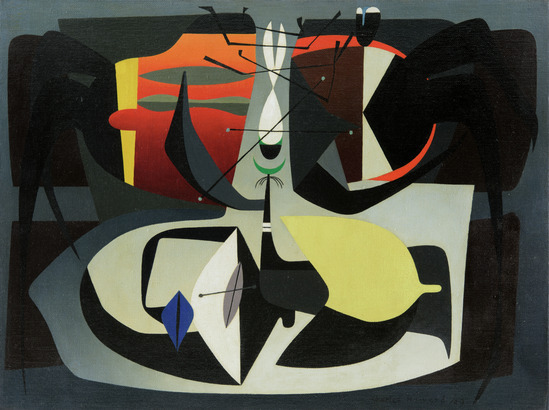 Charles Howard: The Aimant, 1949; oil on canvas mounted on board; 12 x 16 in. ; BAMPFA, purchase made possible through a bequest of Phoebe Apperson Hearst, by exchange, and funds provided by the Norma H. Schlesinger, Andrew & Paul Spiegel Fund, the Marcia Simon Weisman Foundation Fund, the Jan Boyce Fund for Contemporary Art, the Friends and Trustees Acquisitions Endowment Fund, and Sally B. Woodbridge. 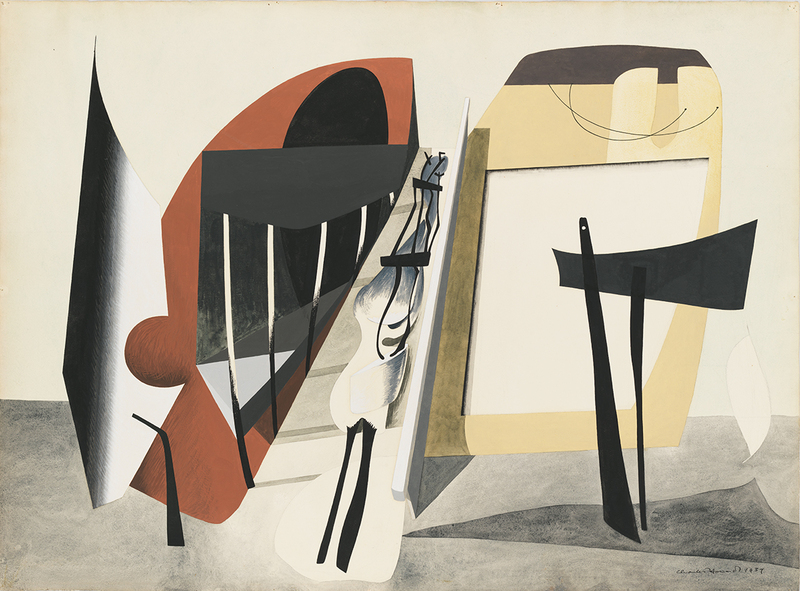 Charles Howard: Hare Corner, 1939; gouache and graphite on paper; 26 5/8 × 35 7/8 in. ; Whitney Museum of American Art, New York, purchase, with funds from the Katherine Schmidt Shubert Purchase Fund. Digital image © The Whitney Museum of American Art, New York. canvas: 12 x 16 in. 26 5/8 × 35 7/8 in. Explore Charles Howard’s arresting art in this fresh, wide-ranging look at the themes and changing contexts of his work as he navigated among figurative, Surrealist, and abstract currents. With Apsara DiQuinzio, Douglas Dreishpoon, Lauren Kroiz, and Jeff Gunderson; moderated by Alexander Nemerov. Enter into abstraction through an automatic drawing exercise inspired by Charles Howard’s enigmatic works. The BAMPFA curator discusses her methodology and process in developing and organizing the exhibition Charles Howard: A Margin of Chaos. Get inspired by Charles Howard’s dreamlike paintings, then make your own surreal compositions. Explore painter Charles Howard’s enigmatic work with the exhibition curator. Often intimate in scale, the enigmatic, meticulous paintings of Charles Houghton Howard (1899–1978) bridge figurative, Surrealist, and abstract currents in early to mid-twentieth-century art. Active in New York, London, and the San Francisco Bay Area, Howard developed an arresting style that is characterized by fluid lines, suspended forms, an exquisite sense of balance and proportion, and controlled brushwork. Hailing from a Berkeley-based family of artists and architects, and son of John Galen Howard—the supervising architect of UC Berkeley—Howard had an active and distinguished career in both the United States and England. A self-taught artist, Howard worked rigorously and painstakingly to develop his paintings and works on paper, often laboring slowly over extended periods. He began as a satirist and muralist in the 1920s, working in the Manhattan studios of Louis Bouché and Rudoph Guertler; his first solo exhibition took place at the Whitney Studio Club in 1926. He moved to London in 1933, and his works from the 1930s show his movement back and forth between Surrealism and abstraction. These early works portray the land undergoing an architectural transformation, typically marked with flags and banners balancing in space. In his later, more abstract pictures, he maintains an emphasis on the depiction of a state of metamorphosis. Howard said that all of his pictures “are closely related. . . . They are in fact all portraits of the same general subject, of the same idea, carried as far as I am able at the time.” What this subject is, however, Howard leaves open to his viewers to interpret. The BAMPFA exhibition surveys Howard’s artistic trajectory with key examples from each decade of his career. Through approximately seventy-five drawings and paintings, Charles Howard: A Margin of Chaos demonstrates the exceptional nature of this underrecognized artist’s work. Charles Howard: A Margin of Chaos is organized by Apsara DiQuinzio, curator of modern and contemporary art and Phyllis C. Wattis MATRIX Curator, with Valerie Moon, curatorial assistant. The exhibition is made possible through major support from the Terra Foundation for American Art. Additional support is provided by Michael Rosenfeld Gallery, Galen Howard Hilgard, Bonhams, and Claire and Dan Carlevaro.